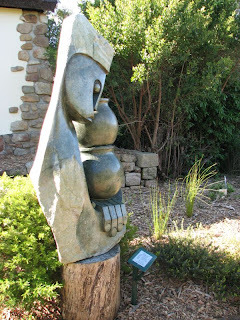 At the beginning of October Carol was exhibiting at the Kirstenbosch Botanical Gardens. We took the opportunity to take a walk around the gardens and I spent some time examining and photographing the work of a number of Zimbabwean stone sculptors. I find this work extraordinary and in everyway comparable with some of the best work produced anywhere in the world. 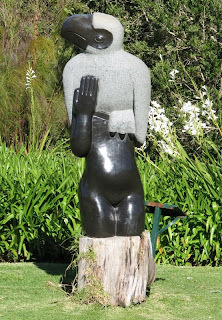 Although the work on display in the gardens is recent it has it roots in a tradition dating back many centuries. The stone carvings found at the Great Zimbabwe, an archaeological site dating back to about 1200 AD, are quite similar in character and style. Carving in stone began to experience a revival in the early sixties. Artists working from small workshops, with encouragement from the director of the National Art Gallery in Zimbabwe, began producing a substantial volume of work, much of which was sold to tourists by informal traders operating at places like the Victoria Falls, the Great Zimbabwe Ruins and at sites in and around the larger cities. Close examination of the work reveals its unique character. Much of it is very stylised and abstract, depicting people, animals and forms from tribal legend and stories passed from generation to generation. 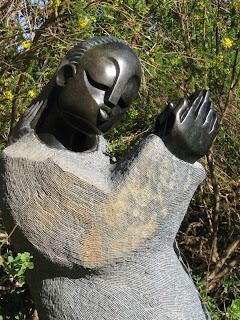 Often termed Shona sculpture, because most of it is produced by artists of the Shona tribe, it moved into the international arena toward the end of the twentieth century and is now exhibited in galleries around the world. The materials used by the artists are carefully selected to compliment the subject matter. I have read that many of them feel a spiritual connection with the rock and believe that they are freeing a shape already present inside the stone. Favourite materials are green opal, serpentine, a dark brown or black stone, Springstone, a very hard serpentine with a fine texture and verdite, a semi-precious stone. When sculpting is finished the stone is heated with a gas flame, which brings out the colours of the stone. It is then waxed and polished to a brilliant glossy finish. The photographs do not do justice to the works. To fully appreciate their powerful impact they need to be seen and touched. 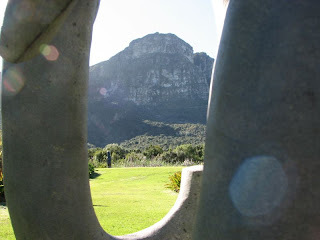 The magnificent Kirstenbosch Gardens provide a majestic backdrop to these remarkable works. If you have the opportunity, go and see for yourself! Wow Bryan, these sculptures are really beautiful! Thanks for sharing them with us. Thank you. I'm glad you like them. Their unusual abstract qualities and the intricate detailing absolutely fascinated me. In "the flesh" they have a tremendous impact. Thank you so much Oliver. Carol.